the orange sky and the sun slowly setting to the horizon makes the fantastic sight. Enjoy the cityscape view of Naha on our open deck until we reach our underwater destination. Please note that due to weather and visibility, the Captain may alter our intended course. "Orca" is a comfortable cruise which allows you to view real tropical aquatic life of the seabed. *You may have a meal at either of the available hotels after the underwater sightseeing tour. 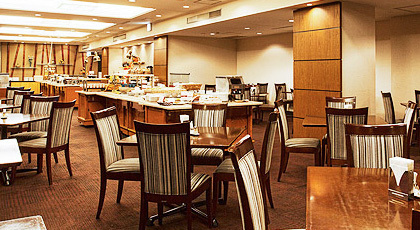 Enjoy a Japanese and Western style lunch buffet in an friendly and home-styled restaurant. *Schedules may be cancelled or stopped due to the weather and sea conditions. *It might be a bit loud with a party of tourists. Reservation should be made at least 2 days prior to the departure date. *Please put your phone number that we can contact you. *Pleaase write on the box below and notify us if you have any questions. *For the cancellation, we will charge 50% (if cancelled by the day before) and 100% if cancelled on the day of departure. *Please call us for cancellation since we cannot take that via e-mail. *You cannot use other deals or services with this plan. Please confirm and press Next. *Please make sure your phone number is correct.